The reed switch is an applied magnetic field operated electrical switch used in a wide range of applications. It contains a pair (or more) of magnetizable, flexible, metal reeds whose end portions are separated by a small gap when the switch is open, and when closed these reeds will come together due to magnetic field completing the circuit. Globally, increasing demand from end-use industries as a result of growing demand for end products is expected to result in an increased demand for reed switch and hence it is expected to be the key demand driving factor during the period of study. Geographically, Asia-Pacific dominated the reed switch market driven by higher demand and consumption of reed switch in a wide range of applications in major end-use industries in the region. Asia-Pacific was followed by North America and Europe as second and third largest market for the reed switch market. Asia Pacific is projected to have the fastest growth, owing to rapidly expanding industrial base and growing number of end-use industry players in developing nations such as China and India in this region. 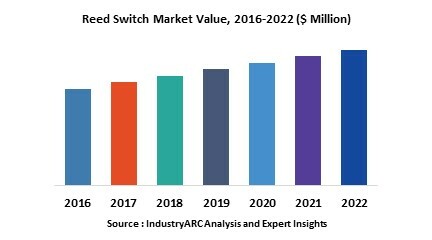 This report identifies the reed switch market size for the years 2014-2016, and forecast of the same till the year 2022. It also highlights the market drivers, restraints, growth indicators, challenges, and other key aspects with respect to the reed switch market. Reed Switch market research report is classified on the basis of applications. Some of the major applications covered in this report are as follows: Temperature Sensing, Relay Application, Pulse Counting, Position Sensing. Reed Switch market research report is classified on the basis of end use industry. Some of the major end-use industries covered in this report are as follows: Electronics & Communications, Consumer Durables, Automotive, Construction & Security, Robotics & Automation, Marine & Weather, Internet of Things (IoT), and Others. This report has been further segmented into major regions, which includes detailed analysis of each region such as: North America, Europe, Asia-Pacific (APAC), and Rest of the World (RoW) covering all the major country level markets in each of the region.